St Helens cemented their place on top of Super League with a superb six-try Good Friday derby win at Wigan. 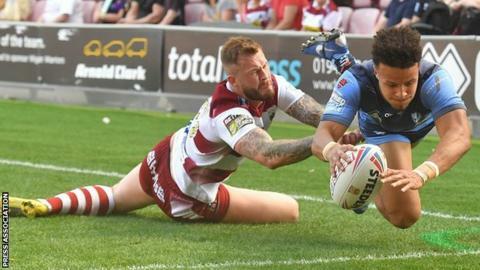 After James Roby's early Saints try, Welsh winger Regan Grace lifted himself to joint Super League top scorer on 11 tries with his first-ever hat-trick. Saints added further second-half tries through Tommy Makinson and Lachlan Coote, who also kicked six goals. Wigan, stung by the loss of Tom Davies with a double leg break, scored through Zak Hardaker and George Williams. Apart from winger Davies being taken to hospital with fractures of both his tibia and fibula, Wigan also had young half-back Jake Shorrocks stretchered off late on following a challenge which earned Saints lock Dom Peyroux a sin-binning. But Saints, still without half-back Theo Fages, also suffered a potentially serious first-half injury when centre Mark Percival went off with a knee problem. And they also lost second rower Louie McCarthy-Scarsbrook. Saints, who now have 38 Super League derby wins to Wigan's 37, completed a double over the Warriors, having won won 22-12 at Langtree Park in this season's opening game in January. Following their 10th win in 11 games, they now lead Super League by four points after second-placed Warrington's surprise loss at home to Salford. In the week when 2018 champions Wigan discovered that Shaun Edwards will not, as announced, become Warriors coach in 2020, they suffered their ninth defeat in 12 games (including the World Club Challenge) under Adrian Lam. Wigan, who had to suffer "going down, going down" chants from the Saints fans, remain 10th, level on points with the bottom two, Leeds Rhinos and London Broncos. The poor start to the season by injury-hit Wigan, now missing eight first-team players, equals the worst by the reigning champions since Leeds also won just three of their first 11 games in 2016. Both sides play again in just three days on Easter Monday, when Wigan travel to Salford and Saints host Hull FC. The crowd of 22,050 at the DW Stadium - one of two 20,000-plus gates helped set a Super League aggregate attendance record for a round of matches, the combined 79,173 fans who watched the six Round 11 games beating the 78,917 who turned out in round 25 in 2007. "Easter is traditionally one of the biggest weekends in the Super League calendar," said Super League chief executive Robert Elstone. "But to break the attendance record underlines the scale and loyalty of our fan base." The Wigan-Saints derby was also the last commentated on by legendary long-serving Sky Sports rugby league commentator Eddie Hemmings, who began his broadcasting career with BBC Radio Merseyside. "When you play St Helens you have to be at your best but we were never in the game. We got zapped of energy early and began chasing our tails. "It's disappointing obviously. I feel for the team. But Saints were very good. We knew it was going to be tough. Five didn't train all week and Dan Sarginson pulled out. "Tom Davies has dislocated and broken his ankle. The ankle came completely out of its socket. "I'm hoping Jake will be all right but I'm told he's going for scans on his neck now as a precaution." "Regan Grace is playing really well. He's finishing off some good tries. He's exciting and he's quick. If you talk about Great Britain tours, he'd be the first person I'd pick. Honestly, he's that good. "He's definitely capable but there are so many good wingers in this competition. It's up to the selectors and it's early in the season but he's more than capable. For me he's the most underrated player in Super League, although not by us. "Right from the start of pre-season, he's worked so hard and he's such a pleasure to coach. Our whole forward pack is playing really well and he's a big part of that." "To play so well again after the big game last week is really pleasing. We got tested a bit losing a couple of troops but we handled that really well. Guys had to play a lot more minutes than normal and some out of position." Wigan: Hardaker; Davies, Hankinson, Gildart, Burgess; Williams, Shorrocks; Flower, Leuluai, Navarrete, Isa, Smithies, Partington. Interchanges: O'Loughlin, Tautai, Bullock, Greenwood. St Helens: Coote; Makinson, Grace, Naiqama, Percival; Lomax, Richardson; Thompson, Roby, Walmsley, Peyroux, Taia, Knowles. Interchanges: Paulo, McCarthy-Scarsbrook, Lees, Smith.